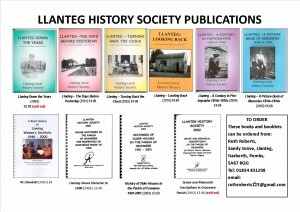 Llanteg History and Picture Books – a great gift for those with Llanteg connections. Three history books and two picture books of families and places up to the 1950s. £5 each and £1.20 postage – email Ruth at ruthroberts123@gmail.com or ring 01834 831298.